Shutter speed is the length of time the camera’s shutter stays open, which controls how long the sensor is exposed to light. Shutter speed and ‘exposure time’ are essentially the same thing expressed in different ways. We take photographs in a wide range of lighting conditions, but the camera’s sensor needs a fixed amount of light to produce a good exposure. In bright conditions you need to reduce the exposure, in dark conditions you need to increase it. 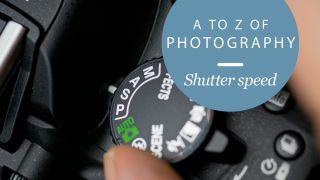 Shutter speed is one of the two main exposure controls used by photographers to make sure the camera’s sensor gets the right amount of light. Like other exposure settings, shutter speeds are calculated so that each step in shutter speed doubles (or halves) the exposure. So for example, changing your shutter speed from 1/30 sec to 1/60 sec will half the exposure. There are intermediate settings in between, but these are the main shutter speeds in sequence. A faster shutter speed produces a shorter exposure, which means the sensor gets less light; a slower shutter speed produces a longer exposure, which means the sensor gets more light. Typically, in bright light you’ll find yourself using faster shutter speeds, and in dim light the shutter speed will be slower. It’s not just about controlling the exposure, though, because changing the shutter speed will also affect the look of your photos. A slow shutter speed means there’s more time for movement to take place during the exposure, and this is often something you’ll want avoid. This can be camera movement, subject movement or both. If it’s camera movement, we call it camera shake. This produces an overall blur that never looks good, which is why there are certain recommended minimum shutter speeds for handheld shooting, typically around 1/30 sec – but it depends on the focal length of your lens and whether your camera or lens has an image stabilisation system. Even if you’re using a shutter speed fast enough to avoid camera shake, you can still get subject movement, and if you want to ‘freeze’ a moving subject completely, you will often need a much faster shutter speed such as 1/500 sec, 1/1000 sec or even faster. This happens most often when you’re photographing sports. There are times, though, when movement blur can actually enhance your pictures. Some sports photographers will choose a shutter speed carefully to keep an athlete’s body sharp, for example, but leave some movement in their hands and feet to create the impression of speed. Or they may take ‘panning shots’ at medium shutter speeds where the subject stays sharp but the background is streaked and blurred. In landscape photography, slow shutter speeds of many seconds are often used to turn waterfalls, rivers or surf into an atmospheric milky blur, and the long exposure times needed for night photography will blur moving clouds and turn moving traffic into a continuous river of light. Shutter speed is also used when shooting video, but here the situation is different. Instead of being used to control camera or subject movement, the shutter speed’s job is simply to make sure that there’s smooth movement between frames to get the ‘persistence of vision’ effect that moving pictures rely on for their realism. This is decided by the frame rate you’re using. At a typical frame rate of 30fps, you obviously can’t use shutter speeds of less than 1/30sec. And if you use a very fast shutter speed to try to control bright light or in an attempt to freeze movement, you get an unpleasant ‘jittery’ effect. In fact, to get the best results you should use a shutter speed that’s twice the frame rate. If your frame rate is 30fps, that means using a shutter speed of 1/60sec – simple as that. Videographers use other means to control the exposure, changing the lens aperture setting or using ND (neutral density) filters to reduce the light passing through the lens.